Home Lifestyle Art & Entertainment Captioning Awareness Week: It’s all about captions! Captioning Awareness Week: It’s all about captions! This week is all about celebrating the importance of captioning, particularly within the D/deaf and hard of hearing community… it’s Captioning Awareness Week! Captioning Awareness Week (CAW) is in its fourth year running, led by the charity; Stagetext. 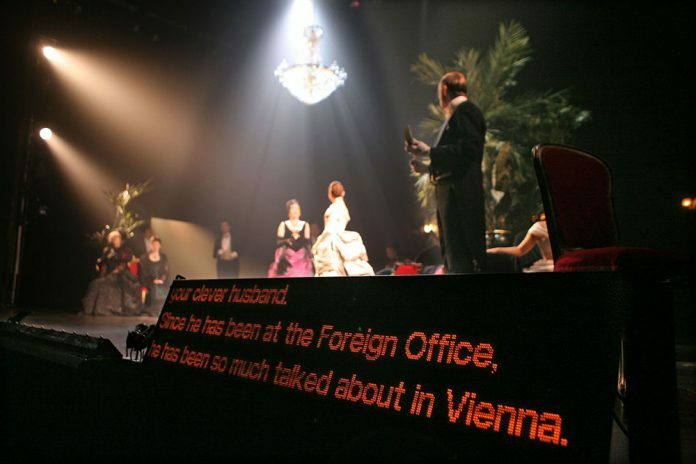 Stagetext works nationwide with arts organisations to ensure events, performances and venues are accessible through live subtitles for their deaf and hard of hearing audiences. They advocate for access and captioned performances on a regular basis and also help to raise deaf awareness within theatres and other organisations. Although Stagetext CEO Melanie Sharpe is not deaf herself, she admits she struggles to hear in some noisy places. Her motivation comes from her desire to ‘enable everyone to have access, especially to the arts, regardless of age, disability, gender or race’. Ellie: Tell us about Captioning Awareness Week! Melanie: CAW is one of Stagetext’s busiest weeks of the year. The aim of the week is ultimately awareness, but the campaign affects people in different ways, so this week is a great way to start a discussion about access. Ellie: Definitely. Not everyone knows how much of the arts world can be accessible to them. If people are missing words, or rely on captions to understand what’s being said, or struggle to follow multiple dialogues, captioned performances open up a whole new world of access! Melanie: Yes, even theatres and galleries are producing more accessible performances and this week is an opportunity to get the message out to the 11 million people with hearing loss to make them aware of these fantastic opportunities. Ellie: What’s Stagetext up to during the week? Melanie: We have a lot of exciting things happening, there are 13 captioned or live-subtitled events across the country. We have our first ever London Underground campaign, with posters in many tube stations, we are also holding our first ever training event at the V&A museum, educating venues about access. Ellie: Amazing. There’s 11 million people in the UK with hearing loss, why is it important to reach out to them and show them about access? Melanie: Arts and culture are incredibly important for people. Experiencing art means you can take part in a wider conversation, without access, one in six of our population would be excluded from this. Ellie: True, inaccessible venues and services can be quite isolating, especially in the deaf/hard of hearing community. It’s great that events can be accessible. It gives deaf and hard of hearing people the opportunity to socialise with family and friends in ways that they may have not been able to in the past, like going to the theatre! Melanie: Yes, many people who don’t require access to events are more than likely to know someone who does. We want those people to tell their friends about Stagetext, invite a family member to a show, or take a neighbour to a museum. Melanie: Each event will need a specific form of access, whether that’s theatre captioning, where the scripts and captions are prepared beforehand and queued live on the day, or providing access with live subtitles, where talented speech-to-text-reporters can type up to 250 words a minute. Every one of our users has individual access requirements, so we provide and advocate for as many forms of subtitled and captioned access as possible. This means we may use caption units, handheld and portable tablets, digital subtitles, and live subtitles depending on the event. Ellie: What can organisations do to improve access? Melanie: Stagetext also works closely with venues to help improve access, looking at the user journey and seeing what we can do to improve that. This is through digital access, making sure accessible performances are easily showcased on their website, easy contact methods are provided and also by subtitling any videos or trailers they have. Ellie: Great, how about attitudes towards access? Melanie: As well as developing access, it’s just as important to improve people’s attitudes towards it. Stagetext run training sessions covering Deaf Awareness and technical sessions on how access can develop audiences. Venues are becoming more passionate about providing access, they are seeing it less of box ticking exercise and more of a necessity and vital part of their productions, which is great to see. Ellie: What’s next for Stagetext? Melanie: Stagetext will always be here to provide the tools and experience to enable venues to be fully accessible, and we want to see the number of captioned and live-subtitled events growing each year. We want to challenge where access is needed for d/Deaf and hard of hearing viewers and champion those venues who work hard! We know that the arts should be open to all and we want to lead the way in making that possible. Ellie: Fabulous, I can’t wait to watch a captioned Mamma Mia theatre show this weekend (keep posted for my blog review!) Remember everyone, to ask your local venue for more accessible showings! Thank you Melanie and the team at Stagetext for the interview!